Born on October 4, 1961 at Udaipur, Tripura. Did his graduations in Arts and Law from University of Calcutta. Was enrolled with the Bar Council of Assam, Nagaland, Meghalaya, Manipur, Tripura, Mizoram and Arunachal Pradesh on September 12, 1990. Practiced mainly at Agartala Bench of Gauhati High Court and appeared in catena of constitutional, civil and criminal matters. Was designated as Senior Advocate on December 21, 2004. Was sworn in as an Additional Judge of Gauhati High Court on November 15, 2011. His Lordship took oath as Permanent Judge of High Court of Tripura on 13.09.2013. 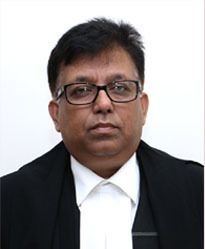 His Lordship officiated as the Acting Chief Justice of the High Court of Tripura w.e.f. 02-11-2018 to 13-11-2018.